Each state on East Coast has a special food that it is famous for. As you read through the list, it’ll become clear how the land, the history and the crops they grow influence the most popular dishes in each state. From sumptuous desserts to fresh seafood dishes, there will be someone for everyone’s tastes. Right in the heart of New England, at the most North-Eastern point of the United States is Maine. While you’re enjoying all of the outdoor adventures, sea kayaking and whale watching included, you’re sure to work up an appetite. The famous eat in Maine is the lobster roll. The lobster roll is a sandwich filled with lobster meat soaked in butter and sometimes served with celery or mayonnaise. You can even find this staple in some of the McDonald’s of the area. After visiting Mount Washington and the Golden Triangle, you can find a few offerings to help with the hunger. The New England boiled dinner consists of corned beef, cabbage and other veggies such as, potatoes, rutabaga, parsnip, carrots, white turnip, and onions. There are variations of it made with ham or beef roast. This hearty meal is perfect for drizzly or cold day, especially after a long day of hiking or museum exploring. When your sweet tooth kicks in or you left just enough room for dessert, you’ll have two options to choose from. The Apple crisp is a delicious soul-warming delight to have any time of the day, not just after dinner. If you want a unique approach to the delicious desserts, the winter time will give you just that. Grab a scoop of snow and drizzle maple syrup on it or grab a few of those delicious apples and drizzle the syrup on top. When visiting Massachusetts, and most places in New England, you can expect to hear the charming tone of the locals as they call a car, cah. They’ll head to the bah (bar) for a few drinks and for food you’ll want to grab a bowl of clam chowdah. This delicious comfort food includes clams, diced potatoes, onions, celery, and parsley as a garnish. In a state that only takes an hour to drive its length, Rhode Island has so much to offer for delicious eats. When you work up a thirst, grab a frosted glass of frozen lemonade to quench yourself and cool off. Grilled pizza is a popular dish and perfect for sharing with friends. If you are ready for more seafood, clam cakes are very popular. If you’re looking for an alternative to pancakes and an alternative to dinner rolls, the Johnny cakes make an excellent option. These cornmeal pancakes are delicious with syrup for breakfast or butter for a dinner side. From New Haven to Greenwich, Connecticut offers such beautiful scenery and charming towns. They also offer three Connecticut originals that you must try. The New Haven White Clam Pizza is more of a common delight around the Yale University home, but many other towns in the state offer it, so be on the lookout! The steamed burger is said to have been invented in Connecticut and it’s a twist on the American classic, the hamburger. For dessert, look no further than the state cookie, the snicker doodle. A popular choice in New York may be the water bagels or the pizza slices larger than the dinner plate, but the New York original comes from the North of the state. Buffalo wings are not only a part of the name of a famous chicken wing chain but also the dinner for many American families during Sunday football. Grab some buffalo wings and a basket of fries while having a few drinks. While you’re zipping through the state visiting Princeton or Cape May, you’ll want a quick and easy meal on the go. You’re in luck, New Jersey is famous for two sandwiches that will be great in the car while you’re exploring all New Jersey has to offer. The Pork Roll Sandwich with Egg and Cheese is a perfect twist on everyone’s favorite lunch sandwich and breakfast favorite. The next sandwich has been the choice for hungry workers at lunch all across America for years, but New Jersey claims it a creation of their own. The Sub Sandwich is the most customizable sandwich around and is easy to have on the go, split with a friend on a park bench, or have one on the boardwalk on one of the New Jersey beaches. In a state largely dominated by the Atlantic Ocean, you’ll spend most of your time in the surf and the sun. Eventually, you’ll want a bite to eat. On the boardwalk, grab some vinegar fries for a salty delight. For dinner, the boiled chicken with sour-milk biscuits will be filling and it will give a unique meal to try. 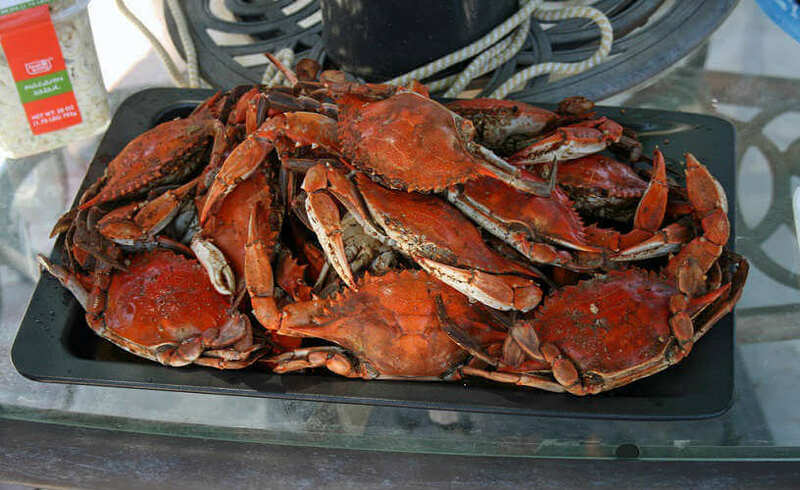 Maryland is well-known for their Blue Crabs, they even have a sports teamed named after them. Whether you like them with old bay seasoning, as a crab cake, or for a great appetizer try the crab dip. This state is right along the coast but it’s out in the country that you will find Virginia’s staple food, Ham. One of the most popular comes from the town of Smithfield, not far from the coastal city of Virginia Beach. The Virginia Ham Biscuits are a delicious breakfast meal, but can also be had with a bowl of soup at lunch, or as a side dish at dinner. The Virginia Ham is also popular for the Thanksgiving holiday meal and for lunch sandwiches. You may want to pack some stretch pants and a large memory card for your camera, with all of these amazing food, you’ll want to take a road trip down the coast and try them all. Don’t forget to pack travel insurance along with your elastic banded pants to protect your health and your holiday.